Meeting serendipitously in Sydney Australia during October 2012 (yes, that recently! ), Kirsten Blatcher and Arienne Gorlach (also known as KBAG) discovered they shared a love of cheesy TV and creativity. LifeTyped is the result of Arienne’s love of reflecting on and celebrating life and Kirsten’s passion for vibrant photographic and typographical art (see the story of how LifeTyped was born here). 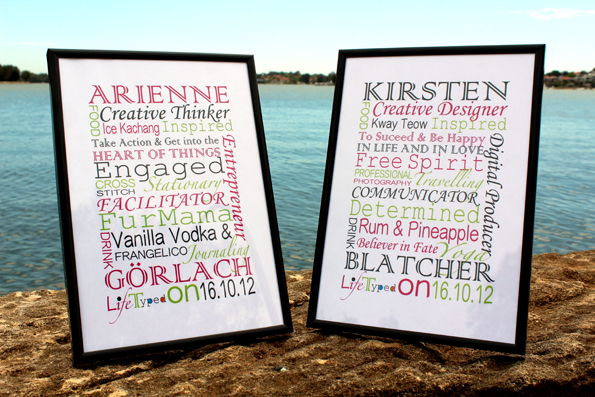 We are working on doing FULLY customised LifeTyped prints like these soon! Kirsten is an explorer and well-travelled woman – with a travel agent mother and a father who always worked aboard, travel has always been in her blood. Born in the birthplace of famous poet & writer William Shakespeare, Stratford-upon-Avon in the UK, she spent much of her childhood living in and travelling to far distant countries in Africa, Asia and the Middle East. Embarking on a round the world trip in 2010 led her to the sunny shores of Australia where she has lived for the past 2 and a half years. From the red carpet of London to the red pindan dirt of WA, Kirsten has worked predominately within the Media, Online and Photographic Industries. With her passion for Photography and her love for Creative design, Kirsten is the design talent behind LifeTyped. 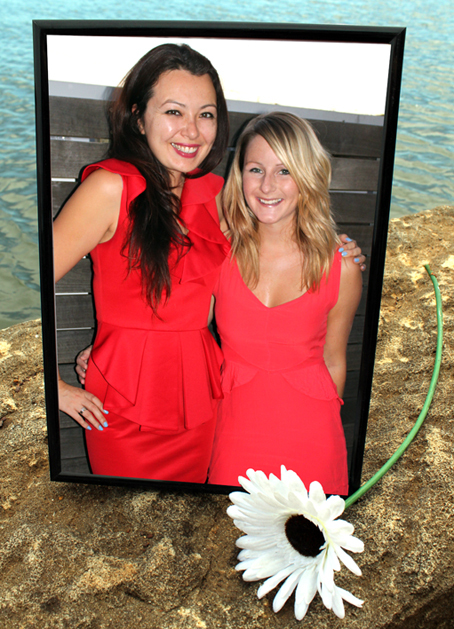 Capturing specific life moments within Photography and Design has become her life mission. She takes pride in sharing lasting memories to those that she loves and takes fulfillment in seeing the joy her creative work brings to others. Kirsten Blatcher Creative – the mind behind…C2Believe Creative Photography & Design. Bringing your Ideas to Life with Professional Photography and Design solutions. Arienne is a multicultural woman – born in Hong Kong to a German father and a Singaporean mother, she lived a nomadic lifestyle before finally settling in Australia long ago enough that she has an Aussie accent. With a business background and entrepreneurial blood running in her veins, Arienne is the operations and strategic mind (that sounds a little boring – but in reality it is much more fun!) behind LifeTyped (though the both of us really do everything!). Bringing her creativity and experience from working in small business marketing, tertiary education administration and the third-sector, she loves creating ventures that celebrate and uplift in the everyday. Arienne is all about empowering and inspiring women to live the lives they want (not the lives that anyone else wants for them). She is a stationery addict and lifestyle design enthusiast who adds value and sprinkles sunshine on everything she does and everyone she meets. The 10thousandgirl Campaign – Content manager for non-profit financial literacy program for young women across Australia.